Come to Premier CDJR of New Orleans to shop our selection of new 2019 Jeep Wrangler models for sale in New Orleans, LA! If you are interested in a new Jeep SUV that offers Leather-Trimmed Seats, Steel Bumpers, Premium Off-Road Rock Rails With Tread Plates, and a Military-Inspired Dana® 44 Front Axle, then visit our Jeep dealer near Metairie and Kenner. Schedule your Wrangler test drive and we'll have your new Jeep ready for your arrival. Jeep offers the 2019 Wrangler in ten models to choose from. The lineup starts with the Jeep® Wrangler Sport. If you're looking to attach tough trails, you'll be glad this new Jeep features the Trail Rated® designation. 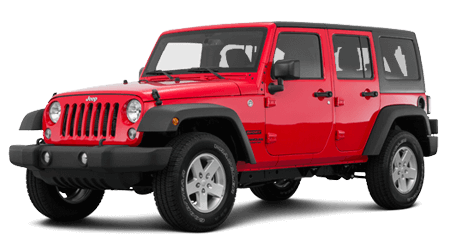 Climbing into the Wrangler Sport S, drivers will enjoy 3.6-Liter Pentastar® V6 engine. Key features include a leather-wrapped steering wheel as well as a chrome and leather-wrapped shift knob. Drivers who take home the Wrangler Golden Eagle will take charge of any trail with 17-inch low gloss bronze aluminum wheels. Other premium features are the winch-capable front steel bumper and a tan soft top with available half doors. The 2019 Jeep® Wrangler Sahara offers a heavy-duty suspension with the command-Trac® 4x4 system to go off the beaten path. Other amenities are its body-color fender flares and NAV radio with a 6.5-inch touchscreen. If you want to test the limits of off-roading, you'll want the Rock-Trac® 4x4 System and Tru-Lok® electronic remote locking differentials in the 2019 Wrangler Rubicon. At the top of the Wrangler line is the Rubicon Recon. This new Jeep is built to dominate trails with its military-inspired Dana® 44 front axle and heavy-duty differential covers. To help you find the new Wrangler to suit your off-road and style requirements, our sales team is waiting for you. We're excited to showcase these systems and features. Start the process of securing your next car loan by applying for Jeep Wrangler financing near Metairie and Kenner! After you drive off in a new 2019 Jeep Wrangler, Premier CDJR of New Orleans will be here to take care of any maintenance need you require. We are proud to boast a reliable service department for New Orleans, LA drivers. Feel free to book your maintenance appointment through our website at your convenience. Visit us soon to see the 2019 Jeep Wrangler!